Mother Earth Project™, MEP, encourages people worldwide to lead more sustainable lives, filled with daily acts of saving and protecting the environment. 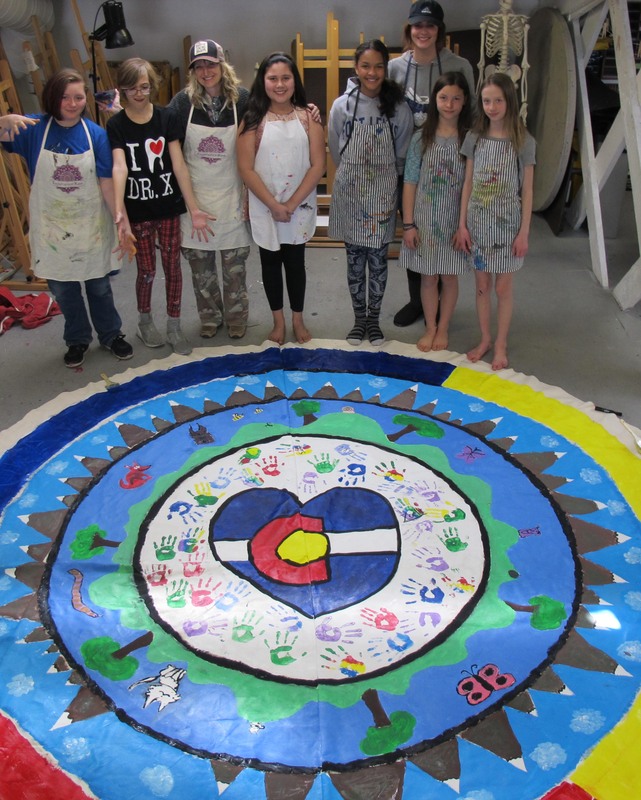 Using artwork as the catalyst for bringing people together, MEP encourages schools and communities to create Parachutes For The Planet, circular works of art that are a metaphor for bringing the world back to a safe place. Once created, these communities commit to implementing sustainable activities that positively impact their environment, such as sharing their parachute with local government officials and demanding better climate laws, switching to LED bulbs, asking restaurants to not use plastic products, and owning a reusable water bottle. MEP also places Mother Earth sculptures in major cities spanning all of the continents. These sculptures are the Symbol of Sustainability, the physical footprint of the project. 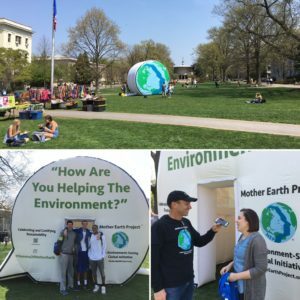 Their locations are sites for sustainability events. “Mother Earth” is a monumental five-meter high sculpture with the likeness of the human profile. This sculpture is conceived as a way to incentivize countries to participate in stopping and reversing climate change, and thus preserve the environment. The idea is that each participating country will place Mother Earth in its major cities, showing its commitment to helping the environment and as a Symbol of Sustainability. To be eligible for receiving Mother Earth, countries must submit their environment-saving actions and timelines to the United Nations. As countries announce environment-saving achievements, MEP posts these major accomplishments on its Country Achievements page. Four Mother Earth sculptures are scheduled to be installed this year and another 30 countries are interested in having a Mother Earth sculpture in one of their major cities. See Sculpture Locations for more details. Mother Earth was designed by scientist and public artist Barton Rubenstein, who with his family began the Mother Earth Project in 2015. Like a silver ribbon of energy rising from the earth, the image of man is created in the form of a profile. This energy symbolizes the symbiotic relationship between earth and humanity. Mother Earth projects two faces, one in the positive space, physical, and the other face is formed from the negative space, using your imagination. This speaks to the yin and yang of the human essence. With a slightly upward looking pose, this multi faceted three-dimensional sculpture presents an ethereal pose, projecting a vision of hope and universality, with a stainless steel material indicating neither race nor nationality. 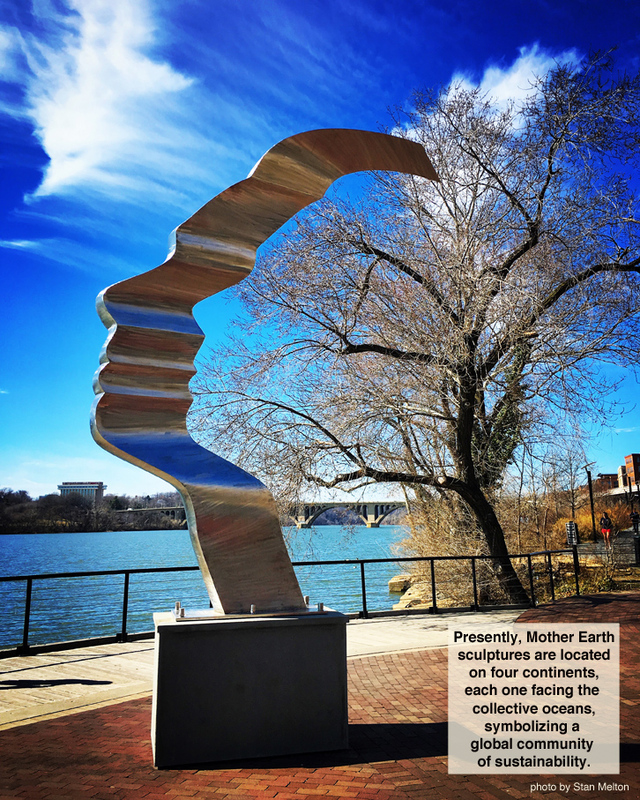 Mother Earth sculptures are and will continue to be placed near to a water source, such as a river or lake, facing downstream toward the collective oceans, a body of water connecting all nations. This symbolic connection acts to strengthen our collective awareness and sense of solidarity. 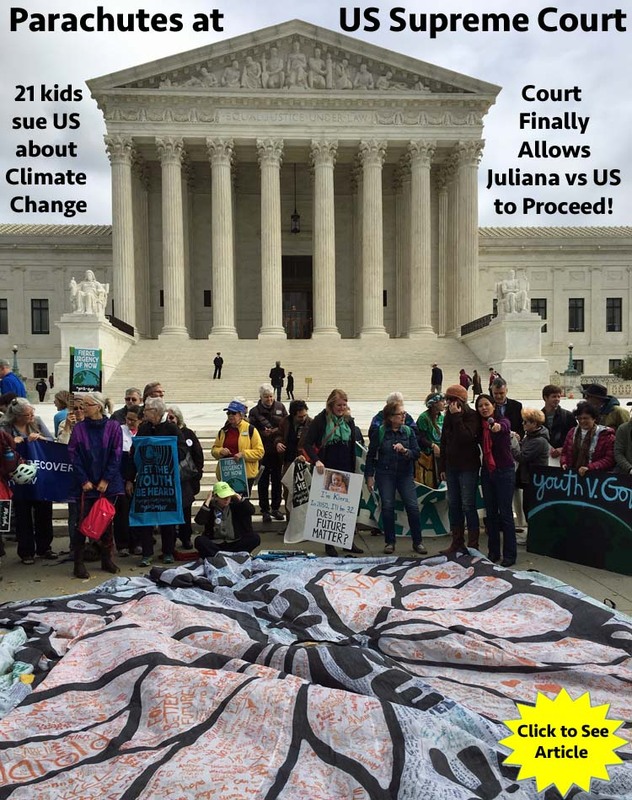 A global project is underway to create hand-crafted parachutes by individuals, schools and organizations decorated with artwork and comments about climate change. MEP is now organizing parachute exhibitions worldwide to raise awareness of our need to live sustainably and save the planet. Visit our Parachutes For The Planet webpage to learn how you can create your parachute and get involved! MEP visits and collaborates with Schools, initiating art and task-based projects. These collaborations culminate in strengthening each community’s focus on the environment, as well as facilitating the connection with other similar schools/orgs from other countries, thus acting locally and connecting globally. 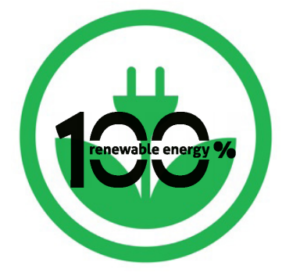 Locally, MEP is reaching out to neighbors in Maryland and Washington, DC to switch to 100% renewable electric energy. Please make the switch and your new Pepco bill will actually be 1%-9% less expensive AND you will receive a free MEP T-shirt! next to the Mother Earth sculpture in Washington, DC, along the Potomac River.